My little guys love trucks and trains and tractors and bulldozers and pretty much anything that makes “big noise” as my grandson tells me. Here are a few that you won’t be able to resist. Features 12 trucks in all shapes and sizes. Purchase the border and background fabrics; use scraps from your stash for the trucks. Personalize with fun business names and slogans on the signs. Use as a wall quilt as shown in the photo or stitch wider and/or additional borders for a larger finished size. 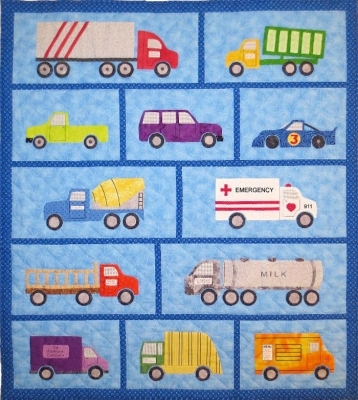 Appliqued trucks on a pieced background. Suitable for hand, machine or fusible applique. Hand or machine quilt pattern. Designed by: SCN – Spring Creek NeedleArt – Nancy Richoux. Does a child in your family like semi trucks? These big, bright trucks should put a smile on the face of any semi-lover. This fun quilt pattern is easy to sew and quick to finish. Pattern designed by Claudia Lash for Presto Avenue Designs. 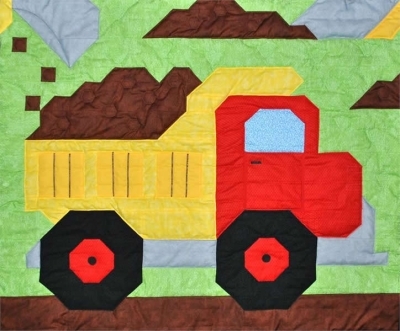 This bright and cheerful dump truck quilt pattern is for all those little ones who love to play in the dirt. Pattern designed by Lisa Muilenburg – Counted Quilts. Hop on the Billsville Express and let your imagination take you anywhere! Here comes Overall Bill on the Billsville Express. All Aboard! This is an adorable applique quilt wall hanging pattern from Betty Alderman Designs. 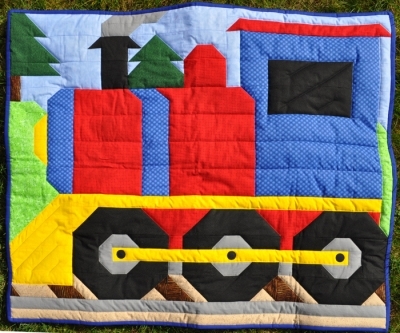 The perfect quilted wall hanging for the little train enthusiast. A super quilt pattern for a little boy or little girl. Choo Choo, All aboard for dream land! 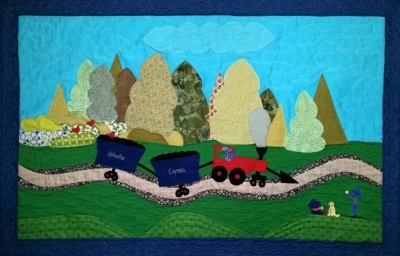 Wrap your little one is this bright and friendly little Train quilt pattern as they travel to the land of dreams. 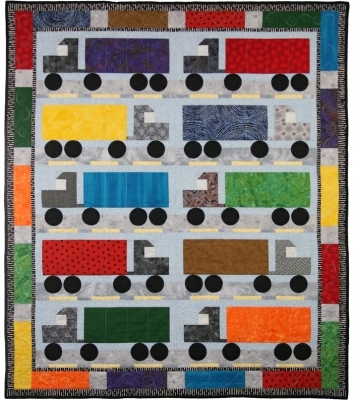 This quilt pattern is for the train lover, young or old. 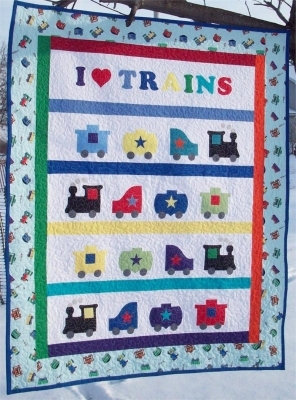 The I Love Trains pattern gives you the opportunity to use up a lot of your colorful scraps. This quilt pattern is compatible with the AccuQuilt GO! Fabric Cutter and contains optional instructions for its use. Don’t have a GO!? Templates are included with the pattern. Space-themed growth chart. Quilt pattern contains templates reversed for fusible applique. A rocket blasts off and makes its way through deep blue space, past stars and colorful planets. 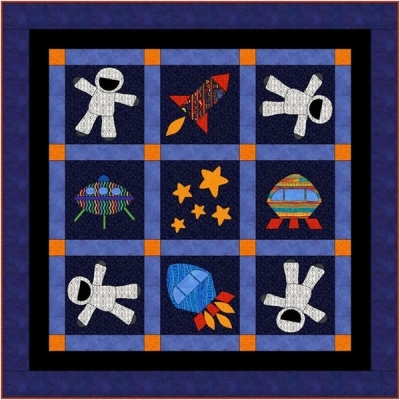 Applique astronauts and aliens alternate with patchwork “star” blocks to create a whimsical border. 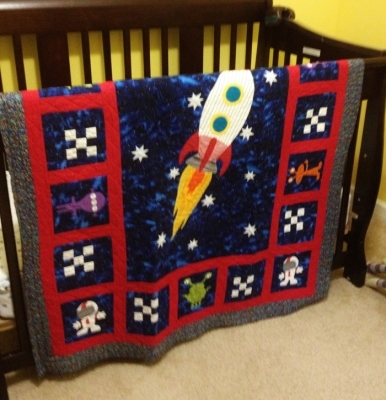 This quilt pattern is perfect for any little astronaut! Designed by: LYTM – LYTM Designs – Janice Holden. Send your little astronaut’s imagination off into space! This quilt pattern is designed with fusible machine applique in mind. Full sized templates are included. Pattern designed by Sindy Rodenmayer – FatCat Patterns. Next time you need to find just the right pattern for your little man, perhaps one of these great designs will work. All — and many more — are available on QuiltWoman.com. This entry was posted in Crafts, Fun!, patterns. Bookmark the permalink.